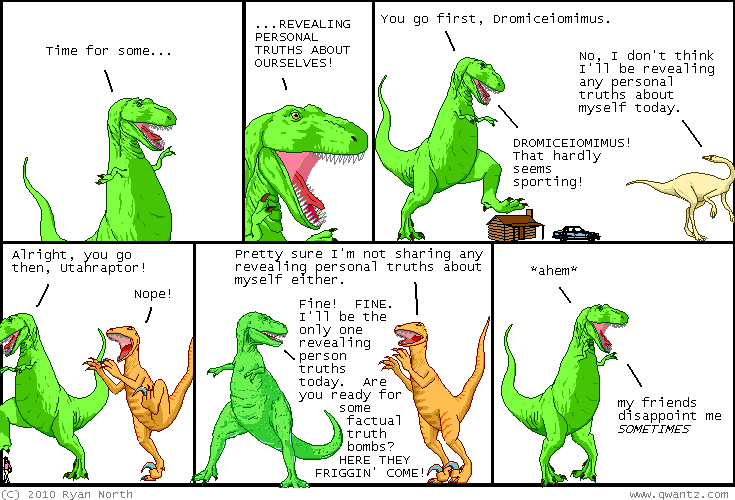 Dinosaur Comics - May 7th, 2010 - awesome fun times! May 7th, 2010: Tomorrow I'm going to be at the Toronto Comics Arts Festival this weekend at the Reference Library, right downtown! This is an awesome show - tons of comics, and it's free to get in too! You should TOTALLY COME OUT if you can. I'm on two panels: one's Saturday at 3:30 called "Tracers, Photoshoppers, Cut & Pasters: Cheaters or Revolutionaries" and one's Sunday at 2:15 and is called "The New Graphic Novelists: New Creators Transforming the Medium". I will be talkin' about COMICS I guess! !